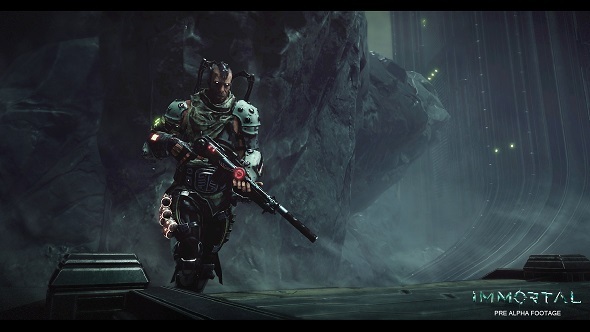 We haven’t seen much of Immortal: Unchained since the teaser shown at E3 last year, but developer Toadman revealed a new trailer this week that shows off some of the dark sci-fi action-RPG’s combat. If this looks interesting, check out our list of the best RPGs available on PC. The trailer (which you can check out above) establishes Immortal: Unchained’s surreal, extra-dimensional sci-fi setting, but what’s most striking is how it seems to be taking the third-person melee combat of the Souls series and throwing in a couple crates’ worth of guns. It appears players will be able to quickly switch from long- and mid-range firearms to close-in melee weapons as they battle the game’s cybernetically-enhanced skeletons, which admittedly is a pretty enticing mix. I, for one, would definitely have appreciated having a sniper rifle around during certain sections of Anor Londo. A closed alpha for PC will run March 8-12, and you can sign up at the official site. Swedish developer Toadman Interactive has consulted on games like Vermintide and Dead Island 2, but Immortal: Unchained is the first title they’ve done on their own, so it’ll be interesting to see how this project develops. It’s slated for release on PC, Xbox One, and PlayStation 4 this year.